Laura Paret, PhD is a child and adolescent clinical psychologist who specializes in cognitive behavioral therapy (CBT) here at Union Square Practice. Part of her work using CBT—which centers on changing the way one thinks and behaves—involves teaching behavioral techniques to young children and adolescents to improve their ability to self-regulate. 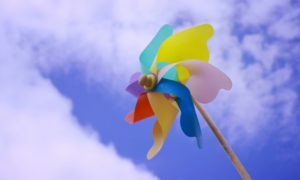 One approach that Dr. Paret takes is to help kids learn how to control their breathing and as she describes it, “be the boss of their own bodies and emotionality.” Through the usage of props such as a colorful pinwheel, Dr. Paret enables her young patients to visualize breathing at different rates of intensity, and as a result, how that makes them feel internally. A huge part of anxiety can be controlled by breathing. When a person hyperventilates during a time of peak anxiety, their body and brain does not get enough oxygen, leading to dizziness, shaking, and overall discomfort. Hyperventilation can indirectly result from the pressure felt in response to important tests, a big game, or any experience in which kids might focus on their performance outcomes. By teaching youth to control their breathing, Dr. Paret is increasing children’s awareness and ability to manage uncomfortable physiological responses that the body can have due to stress, and thus, consequently improving kids’ ability to access their skills and perform at their best.